In the early morning of January 13, 1964, a B-52D bomber, call sign “Buzz One Four,” with a crew of five and carrying two thermonuclear bombs, crashed in a blizzard on Savage Mountain in Garrett County. Two of the crew of five survived. The bombs were found intact in the wreckage. 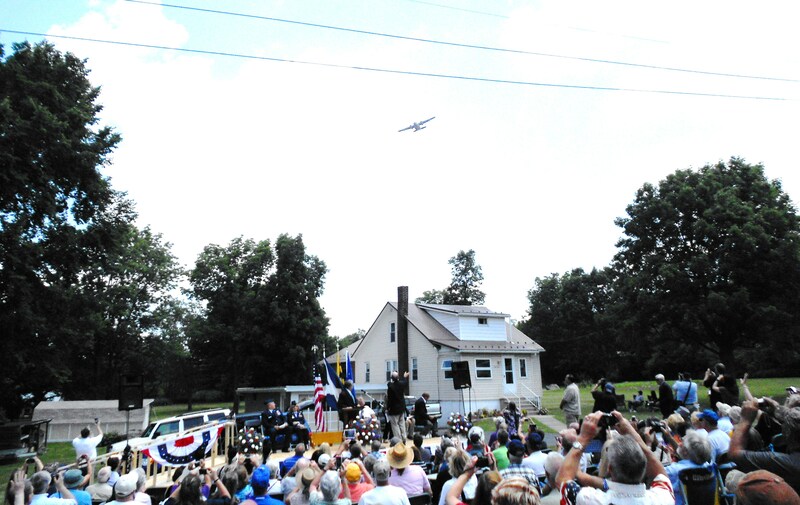 Fairchild C-123K Provider “Thunder Pig” flies overhead during presentation of Governor’s citation by Edward Chow Jr., Maryland Secretary of Veterans Affairs. Photo by Al Feldstein. The Ghost Fleet of Mallows Bay is one of those amazing Maryland historical legacies worth saving, and you can help by supporting the nomination of Mallows Bay to become a National Marine Sanctuary. Our friends at the Department of Natural Resources have all the details available here.